The best vegetarian chili recipe we’ve ever tried. Even better, it’s easy to make, just spicy enough, and can simply be tossed in the slow cooker. One of our trusted recipe testers, Melissa Maedgen, reminded us that not all chipotle chile in adobo is gluten-free. Some brands of chipotle in adobo have wheat flour in them, so check the ingredients carefully. Maedgan recommends San Marcos brand, which does come in a 3.5-ounce can and also happens to be gluten-free. La Costeña brand is also gluten-free. 1. Dump the beans in a large pot and cover with enough water to cover. Let the beans soak at room temperature overnight. 2. After you’ve soaked the beans overnight, heat the oil in a Dutch oven or large pot over medium heat. Toss the onion into the pot and cook until it’s slightly softened, about 5 minutes. Add the garlic and cook, stirring frequently, until the onions are translucent and just beginning to barely brown, another 3 minutes. Add the salt, cumin, chili powder, and oregano and stir to combine. 3. If making the chili on the stovetop, drain the beans and dump them in your Dutch oven along with the scallions, chipotles chiles in adobo sauce (you may want to first stem and seed the chiles and puree them with some of the sauce), tomatoes, and broth. Bring the chili to a boil and then reduce the heat, cover, and cook at a very gentle simmer until the beans are tender and chili has reached the desired consistency, about 3 hours. If making the chili in a slow cooker, drain the beans and dump them in your slow cooker along with the contents of the Dutch oven, the scallions, chipotles chiles in adobo sauce (you may want to first stem and seed the chiles and puree them with some of the sauce), tomatoes, and broth. Cover and cook on low until the beans are tender and chili has reached desired consistency, at least 10 hours and up to 16 hours. 4. Ladle the chili into bowls, strew some scallions on top, and pass the lime wedges on the side for squeezing. If you want to get this vegetarian chili on your table even quicker, just break out your Instant Pot or pressure cooker. Follow steps 1 and 2 above and then drain the beans and dump them in your Instant Pot or pressure cooker along with the scallions, chipotles chiles in adobo sauce, tomatoes, and broth. Cover the pressure cooker with its lid and seal according to manufacturer’s directions. Cook for 30 minutes. Remove the pot from the heat and, if using a pressure cooker, allow it to depressurize but do not take off the lid. (The cooling process will decrease the pressure naturally, which ought to take about 20 minutes. Alternatively, you can place the pot under cold running water to release the pressure.) Once the pot has fully depressurized, remove the lid and ladle the chili into bowls, strew some scallions on top, and pass the lime wedges on the side for squeezing. 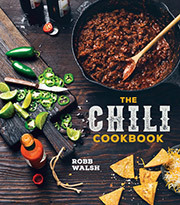 Vegetarian Chili Recipe Recipe © 2015 Robb Walsh. Photo © 2015 Eva Kolenko. All rights reserved. All recipes and photos used with permission of the publisher. Over the years, I've tried many vegetarian chili recipes, only to be disappointed with both the amount of work and the result. This vegetarian chili recipe is the exception. Not only was it simple to prepare with little preparation required, but it also had a wonderful, spicy flavor from the chipotle peppers. It may be a bit fiery for some, but it was the perfect amount of heat for our household. I made this three-bean chili in the slow cooker and the only problem I ran into is the beans weren't done after 10 hours cooking on low. I turned my slow cooker up to medium and cooked for an additional 5 hours and they were perfect at that time. I will definitely be making this recipe in my slow cooker again, but next time I will try cooking it on high instead of low to reduce the cooking time. Keep an open mind. That's what I had to keep telling myself as I made this recipe. Coming from Texas, I have strong opinions about what should and should not be in chili, and sometimes it's hard to get around them. Even though beans will get you disqualified from a chili cookoff, I understand and accept that most home cooks in Texas DO use beans in their chili, for the simple reason that it extends the meat and makes for a more economical dish. Chili is not supposed to break the bank. So beans, OK. Vegetarian chili, OK. But chickpeas? Tomatoes? We're pushing the limits of respectability here. I'm glad I kept an open mind and made this vegetarian chili recipe, because it turns out that it is excellent. Even a grouchy Texan like me will admit to that. I made the homemade chili powder that goes along with this recipe, and it's worth the trouble. I've never used commercial chili powders, because I like to know the proportion of chiles, cumin, etc., going into my chili. I'm going to confess here that I did go a little heavy on the chili powder when I made this chili, using 2 tablespoons instead of 1. I couldn't help myself. The chipotle in adobo is what adds the heat to the chili, and the amount used is just perfect, so you have a mild burn but still enough room to add spicy garnishes if you desire. Overall, this recipe has a nice balance of heat, savory richness, and a great texture. I was worried with three types of beans that they wouldn't get evenly cooked, but they did. The 3-hour cooking time was perfect. All in all, this was a great vegetarian chili with flavors a little brighter and less heavy than my usual tomato-less version. The beans sold by Goya as "small red beans" are fantastic for chili and would work well here. This vegetarian chili is a simple recipe with uncomplicated ingredients that delivers a lot of flavor. My teenage tasters rated it a 9+. They loved it! I used a combination of small red beans, Roman beans, and garbanzo beans. I soaked them during the day while I was at work and then put the chili together when I got home. I used 2 large cloves of garlic, smashed lightly with the flat of my knife (I prefer this to chopped garlic). I also only used 1 tsp of kosher salt and didn't need to add more later. My chile powder contained chipotle chiles, and so the overall dish was quite spicy—not too hot, but I might back off on the chile powder a bit next time. It made me sneeze for hours! The recipe does not say to do so, but I chopped the canned chipotles. After sautéing the vegetables and spices, and combining the ingredients on the stove, I transferred the chili to my slow cooker and let it cook overnight, which ended up being about 10 hours. I then refrigerated the chili and reheated it for dinner that night, serving it with short grain brown rice. The resulting chili is deeply flavorful and smoky tasting, with quite a lot of broth. If using the slow cooker, you have to remember that you will get less evaporation, and maybe use less liquid. I mashed about a cup of the beans and added it to the chili to thicken it. I also like more vegetables in my chili, so I sautéed a small red bell and a small green pepper and added it to the chili. Some chopped carrot, squash, or sweet potato sautéed along with the onions would also be excellent. Avocado, sour cream, or yogurt, would be lovely toppings. I'm really glad I put some in the freezer for a quick meal on a busy night. 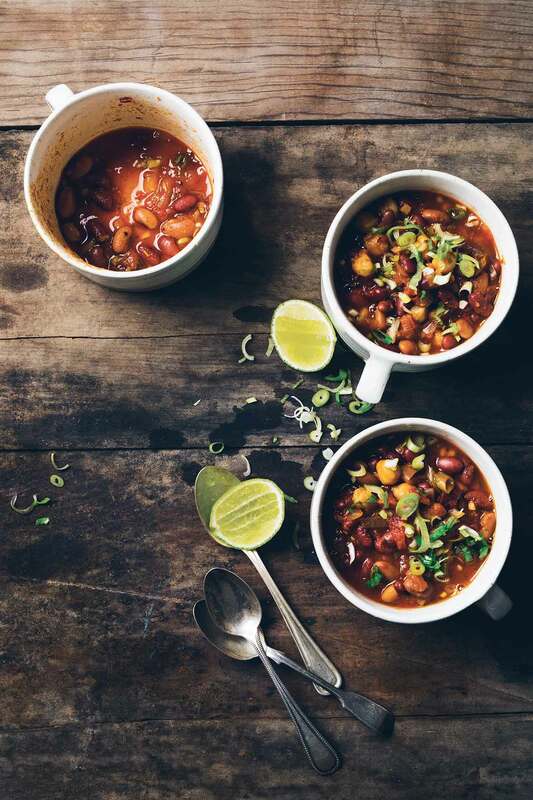 This is a great low-stress vegan chili recipe with smokiness and “meaty beans” so that even an omnivore will enjoy this. It's a great alternative to my long-time favorite, a black bean chile recipe from Cafe Beaujolais. With 5 minutes of effort the night before and a half hour of prep and just a bit of attention the day of, this is a perfect fall recipe that doesn’t require extensive fuss. Perfect for #MeatlessMonday and definitely qualifies as moreish. If you use a store-bought broth (I used Rapunzel Vegetarian Bouillon with Sea Salt, as I didn’t have a batch of vegetable broth made), you might want to reduce the salt a bit and check at the end so you can make adjustments, if necessary. If you have a good favorite chile powder, use it or make your own. (I keep a tub of Santa Cruz Chili Powder from Tumacacori, AZ, on hand as my mild chili powder of choice.) Choose a nice big Dutch oven which holds heat well. This cooked for 3 1/2 hours (the garbanzo and pintos were a bit firm still at 3 hours while the kidney beans were thoroughly cooked) and will not suffer when reheated. If your burner has a hard time keeping a low simmer, try using a diffuser. In the beginning, I stirred the onions often so that they'd soften and take on a bit of color but not scorch. I added a tiny amount of broth once the seasoning was in to make sure I deglazed the pot and captured any fond that developed on the bottom of the pan, added the beans, tomatoes, etc., and the rest of the broth. Even though you will probably give this at least 3 hours, check and stir every so often, maybe leaving the lid slightly ajar if there's too much liquid. (I did this for about 30 minutes towards the end of the first 3 hours but put the lid fully on for the extra 30 minutes, as I was happy with the texture.) The beans were still firm but nicely done and wouldn't have suffered if I cooked it 4 hours. The smoky flavor of the chipotle gave a perfect balance of heat and depth. This was a very easy recipe, and I was happy I didn't have to seed and rib fresh chiles! It's almost a pantry meal. All you need fresh are the onions, scallions, and garlic—things usually on hand. It gave me a whole new appreciation of the use of smoked chiles. I knew the recipe was a success when my husband made the recipe again in the pressure cooker! For the pressure cooker version, he only soaked the beans for 6 hours, used a combination of Santa Cruz mild chili powder (2 teaspoons) and Rancho Gordo New Mexico red chili powder (1 teaspoon), and 3 cups broth (made with the amount of Rapunzel bouillon needed for 4 cups because there's no significant evaporation in the pressure cooker). He also didn't add the salt called for in the recipe because the broth had sea salt, and the tomatoes and chipotle in adobo both contained salt. You probably don't have to omit the salt if you use homemade vegetable broth. He used our 7-liter Kuhn-Rikon pressure cooker to make this recipe. After 30 minutes of pressure cooking (ring 2) ), the beans had a creamy texture and were thoroughly done. This chili was just as terrific and satisfying as the 3-hour stovetop version. I can’t remember where the information came from, but apparently the acid in tomatoes prevents beans from getting tender. I usually wait until the beans are nearly cooked before adding the tomatoes. Lei, yes, I’ve heard that, too. And I, too, hold off adding tomatoes to a bean dish (as I wrote in my cookbook). But our testers didn’t find the to be the case when using beans that weren’t old. Give it a try. Oh no! I am just seeing this recipe after I’ve just bought the ingredients to make the Smoky Vegetarian Chipotle Chili from your site for Super Bowl. How do they compare??? Should I change course? Look forward to hearing your comparison on these two recipes! Thanks! Rachel, I feel your indecision! Fortunately you can’t go wrong with either of these vegetarian chili recipes as our recipe testers raved about each. The Vegetarian Chili Recipe above is essentially a three-bean chili so it’s going to be very dominated by beans. The Smoky Vegetarian Chipotle Chili is also a three-bean chili although it includes more fresh vegetables such as zucchini and bell pepper. So it really just depends on your personal preference. Both have a mild but noticeable chipotle smokiness that’s quite nice. Kindl let us know which recipe you choose and what you think, Rachel! Ok! I’m going to stick with my gut and go for the Smoky Chipotle Chili, will be making it tonight in anticipation of our Super Bowl party tomorrow! I’m so intrigued by the chipotle/cilantro stem/garlic mixture, I can’t wait to see how it tastes. Will report back! ~ Soak in water for at least 5 hours. ~ Pour away the water. ~ Boil briskly in fresh water, with occasional stirring, for at least 10 minutes. Undercooked beans may be more toxic than raw beans. Does the long soak followed by the long cooking time kill the toxin in this kind of recipe? This sounds like a great chili and I’d love to give it a try! Hi Daniel, I think it is always best to trust your gut- no pun intended. If you have concerns about toxicity of beans, I would abide by the FDA guidelines. Made this tonight in the Instant Pot and it was delicious. The beans were very nice and soft. I had brined them overnight per America’s Test Kitchen. The chipotles should be stemmed and chopped up. It seemed like it would be a lot of chipotles, but it wasn’t too spicy at all. Just a nice smoky flavor. Amy, excellent! So glad it worked out. I love this recipe and will definitely make this again. I really wanted to make a vegetarian chili without the fuss of waiting 3 hours for beans to cook so I took a short cut and had a fantastic chili in 30 minutes! Instead of using dry beans, I opted to used canned beans which were drained and rinsed. A 15 oz. can of each of the three types of beans called for in the recipe was the perfect substitution for dried beans. I sauteed my onions, garlic and then added the spices (Whole Foods Brand Chili Powder since I did not have time to make my own) to toast for a minute or two then added the beans and tomatoes and chipotle chilies and brought to a simmer. I accidentally used a 7 oz can of chipotle chili thinking it was 3.5 oz (so check your can size) and it was pretty spicy but not intolerable. I chopped the chilies so they would meld into the chili quickly. I added a little cornbread into the chili to thicken, which I had on hand, or cornmeal would also work (about 4 Tablespoons) . In about 15 minutes of simmer time it was time to eat and my family was rewarded with a fantastically flavored and healthy chili. I served the chili with some cornbread and tortilla chips and it was a heartwarming and satisfying dinner. Quite rewarding for the minimal effort to throw this together! Love the cornbread tip, Dawn! Thanks so much for your advice about using canned beans to speed up the cook time.